The reputation of Enterprise Resource Planning (ERP) solutions is damaged. There is no doubt that ERP systems add value to companies, but choosing the right solution can prove to be intimidating. When companies recognize the need for an ERP solution, they sometimes rush into the selection process without first figuring out exactly what they want to achieve from their implementation. These companies often find themselves overwhelmed by the broad range of options available in the marketplace and run the risk of making a rash judgment. This is where Business Management Solutions can step in. Business Management Solutions are faster, simpler and more flexible and eliminate much of the pain associated with ERP selection and implementation process. By going beyond ERP and looking at the wider picture, companies can find a Business Management Solution that matches their exact requirements, without sacrificing business agility. 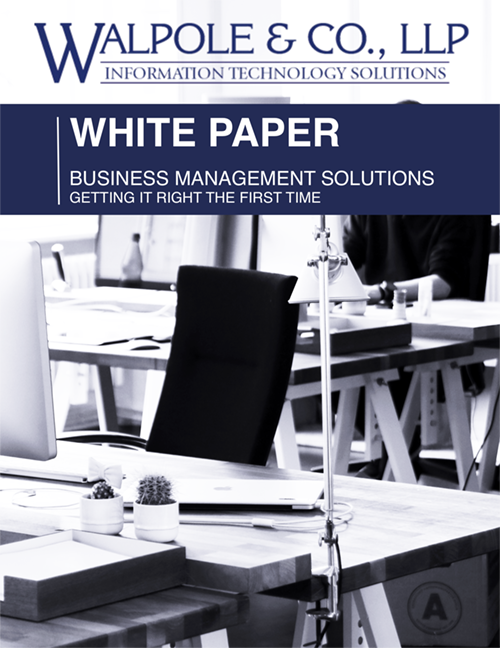 This white paper will help you carry out a much more focused and thorough search to get your Business Management Solution choice right, the first time. Complete the form and download the white paper to learn more.